Many mornings in Port Coquitlam, B.C., before the workday begins, John Goheen gets up. While his wife and daughters sleep, he brews a pot of coffee and quietly slips into his home office. There, he joins his 1,500+ history books, all on the First and Second World Wars, and sets about his passion: deepening his knowledge of Canadian military history, and preparing to make that knowledge as personal as possible for the people he guides for the Royal Canadian Legion Dominion Command Pilgrimage of Remembrance. 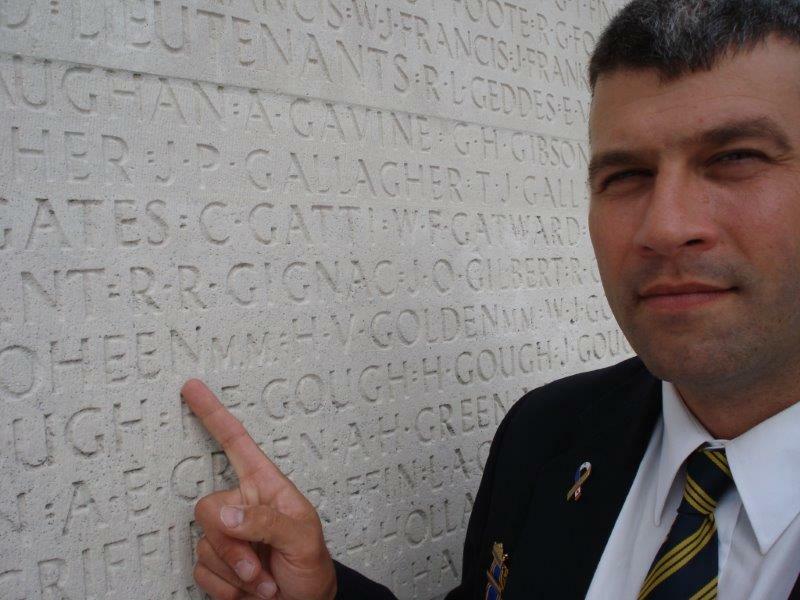 Since 1996, John has served as the Legion’s official tour guide. But his interest in remembrance reaches back to the early 1970s, when he was only a boy growing up in Vancouver, B.C. His love of books went so deep that he started saving his allowance to buy them—the inaugural entries to his now-mighty collection. “The first one I bought was a biography of Billy Bishop, a First World War fighter pilot,” he says. When John graduated from Centennial Secondary School in 1984, he enrolled at Simon Fraser University, completing a Bachelor of Education (with a history major) in 1990. He says he flirted with the idea of joining the military, something he looks back on as a bit of a “coulda, woulda, shoulda thing.” But he realized it wasn’t his calling. “At the end of the day, I don’t take orders very well.” He also knew there was something else that needed his attention. 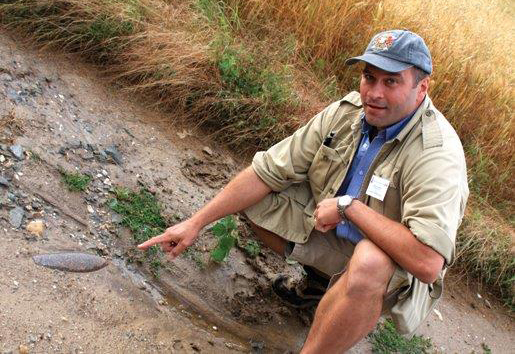 “Teaching came quite naturally to me,” he says. “I got into teaching because I knew there had to be a way of reaching kids differently than how I was taught… Whatever approaches I took to engage my students had a lot to do with the lack of engagement I felt at school. I was a kid with learning disabilities; I struggled. I felt like no one really knew me. (I think teachers thought), ‘There’s John, nice kid, not very great at academic side of things.’ I remember in high school history class, sitting there bored out of my mind. I was a very quiet kid, but the teacher asked a question and I got kind of fed up because no one knew the answer, so I just told him the answer. And he and looked at me incredulously and said, ‘How do you know that?’ He’d never asked me before. John isn’t talking about some “free-for-all.” But he was, and is, determined to learn from his own history so he can help youth benefit from a more balanced educational experience—an environment where teachers engineer learning opportunities for different students based on their specific needs. Humility—and not just a bit of it—carries through all that John does. 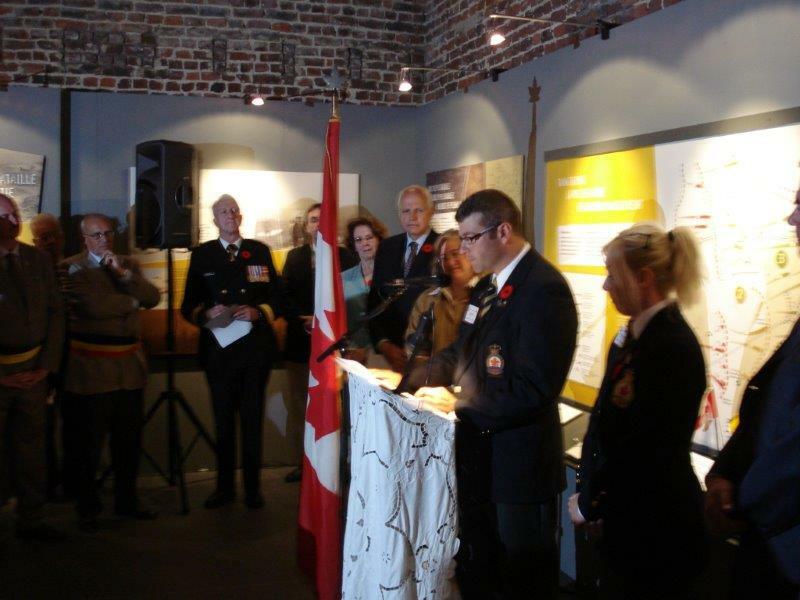 At work, when he shares his devotion to remembrance and his great knowledge of Canadian military history, he’s careful not to impose his interests; instead, he organically works them into the schools’ existing Remembrance Day programs, letting students come to him to ask questions when they’re ready. 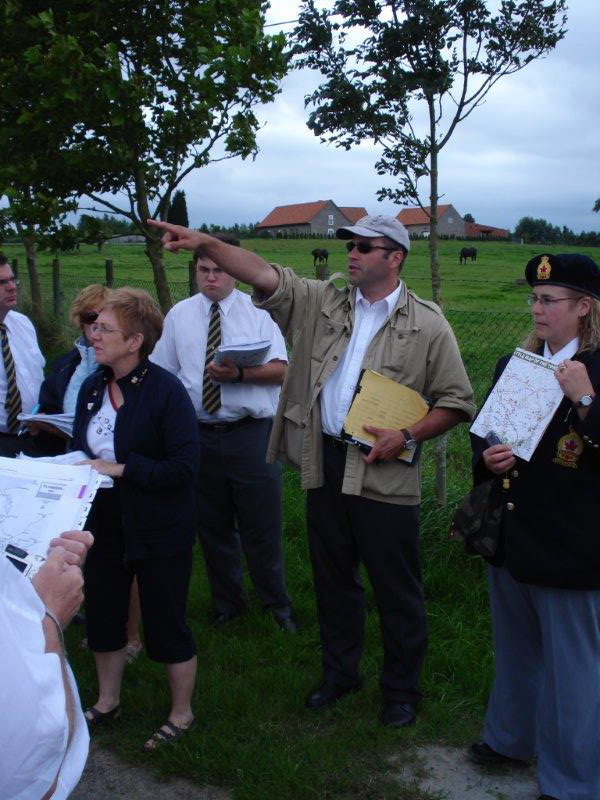 John’s involved and experiential approach to formal education spills over to his volunteer work guiding the Royal Canadian Legion’s Pilgrimage of Remembrance. 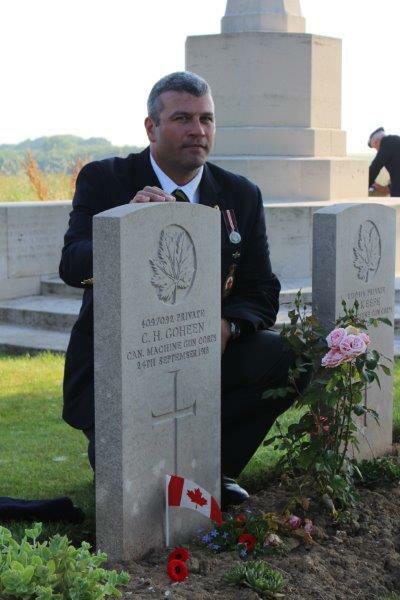 “It was an honour and a privilege to be part of the 2013 Royal Canadian Legion Pilgrimage of Remembrance, and the experience would not have had the same impact on me if it were not for John Goheen. To put it simply, what is often a two-dimensional experience becomes 3-D in technicolour with John. 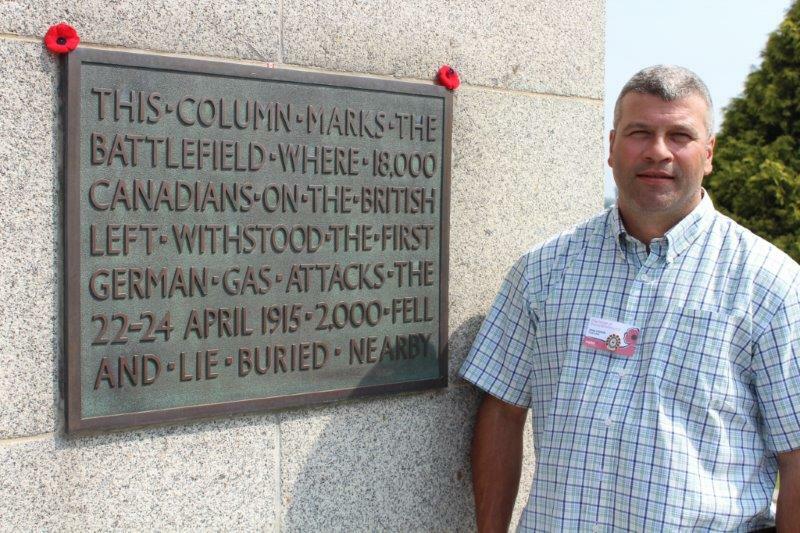 His love of history, his fervent research and his diligence in locating obscure locations where our Canadians had a story to be told, brought events of WWI and WWII to life. Imagine standing in the middle of a cornfield, where a couple of dozen Canadian soldiers were cut down by the Nazis in the days following D-Day, as only two men managed to escape the slaughter and make it to a copse of maples some hundreds of yards away—trees still visible to this day. Imagine weeping as you realize you are standing where Canadian blood was shed in service to King and country. This is but one example of many; John took us on a 15-day journey through two wars and countless stories of heroism, tragedy and national pride.” —Belinda Wilson, Zone Commander, Zone F-4, Ontario Command; Lindsay, Ont. “Under the tutelage of John Goheen, Tour Guide Extraordinaire, I not only saw the horrors of war during the ensuing and exhausting two-week period, but learned also of the valours of war, and saw firsthand where the dark consequences of hatred and strife took place… (The other participants and I) all headed home with a deeper appreciation of the sacrifices that others made for our freedom, and for the unquestionably precious nature of life, which millions of people currently enjoy.” —Sam Newman, 145 Vimy Branch, RCL; London, Ont. “John doesn’t only have the knowledge, he has the heart that brings the stories of the wars to life, that wraps the participants in the stories and the terrible human cost of the tragedy of war. Statistics are cold and impersonal things, but every ‘one’ in a statistic is a person, and John tells the stories in terms of the individuals who fought.” —Brenda Fredrickson, Board Member, Wounded Warriors Weekend Foundation; Regina, Sask. While John was busy launching his career in the education system, it’s clear he pursued his interest in remembrance with equal commitment. He became an associate member of the Royal Canadian Legion in 1991, and participated in his first Pilgrimage tour in 1995 as the B.C. Command Representative. He calls his first tour “a whirlwind—12 straight days of touring, seeing hundreds of different things, it was all just a jumble. I had a good sense of the history, but I imagine someone who was new to this would be completely overwhelmed. I found it overwhelming.” That first tour covered a lot of ground; starting in France, they took a ferry into Dieppe and toured through Normandy. Then they made their way into Somme and around Arras and Vimy, before heading north to Ypres, Belgium and into the Netherlands. Overwhelmed and whirlwinded though he may have been, his expansive knowledge still impressed the Legion president, who came along for the 1995 tour. By the end of 1996, John moved past the ranks of B.C. representative and was invited to become the official tour guide for the next Pilgrimage in 1997. Since then, he has had an unforgettable impact on hundreds of Pilgrimage participants. In the months leading up to every tour he leads, he spends countless hours, even days and weeks, reviewing his history books and compiling notes and documents, all to make each participant’s experience as informed and personalized as possible. He reads up on their deceased relatives and locates where their headstones lie; learns which battles they fought and identifies the fields where they took place. Recognition truly isn’t a factor. Since receiving the medals, just as he did before them, John continues his early morning routine of reading up on history before preparing for his present. That present includes running Rochester Elementary; spending time with Leslie, his wife of 12 years, and their daughters Megan (10) and Ava (6), as well as his daughters from a previous marriage, Jennifer (20) and Leanne (16); playing a little hockey and tennis; and never forgetting to honour those who made it possible for him to enjoy the life he has. Keeping that top-of-mind, John is working with the Port Moody Station Museum to develop their upcoming McKnight Centennial Trench, a three-year exhibit scheduled to open July 1, 2015. And he has been commissioned to design and write all historical features for this year’s edition of the Royal Canadian Legion/BC Yukon Command’s annual Military Service Recognition Book. This July, he’ll lead another Pilgrimage, taking people from across Canada to tour Europe: France, Belgium and Holland. He’s determined that the sacrifice our veterans made will not be lost on future generations. “I think Canadians of today have a hard time appreciating what the generations before them did in the First and Second World Wars,” he says. “There’s a huge debt. It’s a debt I don’t think we can ever repay, but I think by remembering, we’re at least showing that what they did mattered. To me, it’s really about a way of giving back. Living a good life and being mindful of what’s been done for you is a way of saying thank you. To connect with John, email jgoheen@telus.net. For more about his work with remembrance, read the articles he wrote for The Tri-Cities Now. You can visit legion.ca for information on how to join the Pilgrimage or become a member of the Royal Canadian Legion. Thank you to Port Coquitlam’s Dan Gibson for recommending John as a Kickass Canadian. Thank you very much Amanda for this informative and inspiring profile. John Goheen truly took the torch and holds it high, in remembrance and gratitude. My pleasure, Catherine! He’s doing so much for Canadians. His trips sound incredible. Canada is a great country. We owe a tremendous debt to those Canadians who sacrificed everything to maintain our freedoms, our way of life. We can never repay that debt, but as John’s story suggests, we can honour their sacrifices through remembrance and by striving in our daily lives to maintain the integrity of our freedoms and build on the greatness of Canada. 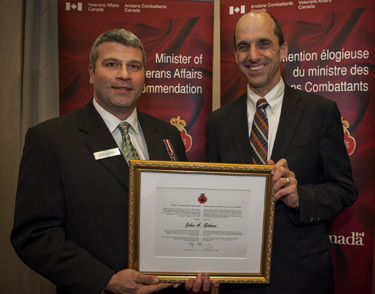 What inspired me to nominate John Goheen was not that he was a high profile star of Canadian sport, politics or cinema, it was because he epitomizes what we all aspire to be as Canadians… humble, hard working, well-intentioned, contributing members of our society; John does this in spades. By day John is a principal, doing everything he can to improve the education and the lives of our children. During his free time, John selflessly dedicates hundreds of hours in preparation for his WWI and WWII tours (not to mention all of his other volunteering efforts). He does it not for awards or recognition, rather all that he does is motivated by the belief that it is to the benefit of those around him and to the betterment of his country. John is a Kickass Canadian! What an accomplished man! Makes one want to sign up for one his tours and take along everyone you know! Congratulations, John, from your proud family.